Grease and oil are natural by-products in food processing and preparation industries. Unfortunately, these by-products often lead to clogged drains, backups, and rancid odours. 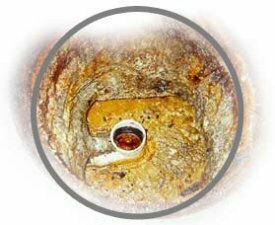 Since grease floats on water, it accumulates inside pipes (see image 1 & 3) from the top down, eventually clogging the drain and creating a backup. There are NO quick fixes! Caustic chemicals, enzymes, surfactants (soaps), solvents, or mechanical routing (snaking) do not solve this problem. Instead they simply relocate the grease or actually compound it. Chemicals and routing can also cause significant damage to pipes, resulting in costly downtime and repairs. Enzymes, solvents, and surfactants simply move the grease problem further down the line, where the clogging will repeat itself. Our Grease Eradication System (GES®) is a cost-effective, environmentally friendly system that "remediates" grease problems for good. Our state-of-the-art technology harnesses the power of bioremediation, a natural process in which bacteria actually consume grease and oil from drain lines, grease traps, and interceptors. These bacteria are non-toxic, non-pathogenic, live, and vegetative. Best of all, they turn grease and oil waste into harmless by-products mainly water. So not only do our bacteria fix the problem whilst helping the environment - they also help you save valuable time and money that might otherwise have been spent dealing with the drudgery of unexpected drain blockages, backups, and the foul odours normally associated with these problems.